It is often the case that artists who are the most well-known or who have been around a genre of music the longest are the ones that everyone wants to review and I will be the first to admit that time sometimes constrains me as what I can listen to and review for Ambient Visions. There are times that I wish that I had a staff of writers for AV so that all of the music that we receive gets a fair share of the spotlight on the site. 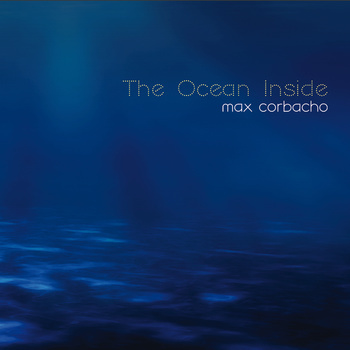 Max Corbacho is one of those that I have neglected over the years and I wanted to start to atone for that lack of coverage by reviewing his last album which came out in 2012 and is called The Ocean Inside. Max Corbacho was born in the southwest of Spain in the province of Badajoz which makes it even more important that those of us in the U.S. get to know the name and appreciate the great ambient music that Max creates and releases. The ambient community is not bound by the artificial borders of the world anymore. When it comes to the music that we will appreciate and listen to the internet has created a borderless, open community of music lovers and creators that speak to each other in the universal language of music. The Ocean Inside is actually a double release so that it has the equivalent of 2 albums contained in the digital download of this project or two CD’s if you are buying the physical product from Max. With a title like The Ocean Inside you would be right to guess that the music contained here would be vast in nature as well as dark and mysterious in the way that the sounds are woven together. The music listeners will find on this album is the equivalent of space music but from an earthbound perspective. We often forget just how profound and mysterious that the oceans that surround us really are. We look at the surface of the water from the comfort of a boat bobbing on the waves drenched in sunshine while below us lies depths that very few have ever descended to explore. Max has captured that quality in the compositions that make up these two discs. With a total of 14 songs that runs for 2 hours and 27 minutes it is very easy to immerse yourself in this environment and feel the cold depths of the water close in around you as you continue to sink ever deeper into the pitch black that seems to go on forever. Max has created points of light in the darkness so as to make the journey into the depths a little less like dropping into a dark bottomless hole and gives the listener some light as if it was filtering down from the surface through hundreds of feet of water. Not enough to call it bright but enough so that once your eyes adjust to it you can vaguely see some things nearby. The Endless Flame is one of those lighter spots as it sheds a dim light on the music that had come before like Offshore Currents which expressed the darker side of the ocean depths. The music that Max composed for this release is quite intense in nature as the synths offer up wave after wave of deep emotions that continually wash over the listener from beginning to end. The first album in this set closes with a 29 minute descent entitled Towards the Bottomless Sea which leaves behind the feeling of waves as you drift ever downward and leaves the listener with the sensation of floating and drifting in the dark completely enveloped in the stillness that is very noticeable in this piece. Max has done a great job with this song as it caresses the listener with a velvet touch that is very soothing and calm and would be a great song to set up as a loop and go to sleep by. Of course I would be remiss if I didn’t comment on the title at this point because I do believe that the ocean Max is referring to is not a physical ocean that we see when we go to the beach but the ocean that lies at the heart of each one of us within our minds and spirits. The title The Ocean Inside speaks to me of a journey of exploration to the darkest unexplored depths that exist within each of our hearts. While it would be easy enough to think more in terms of the dark waters that we have all seen videos of as diving bells sink for miles into the abyss of the physical ocean I think that Max has taken us on a journey to show us that the depths of who we are rarely see the light of day and that if we were to actually dive into those depths it would be very comparable to having dived into the deepest part of the ocean. On The Ocean Inside Max has taken his listeners on a sonic journey that is comparable to the farthest reaches of space or the depths of the oceans or that infinite space that lies within each of us and allows you plenty of time to float and explore that space while his music acts as beacon in the darkness to let you know that all is well. The music you will find on these two discs is a mysterious enchanting work of art and the results are very impressive. Max has shown that he is a highly talented musician and that through his music he is more than capable of translating the many shades of the ocean whether that ocean lies without or within into a musical canvas filled with the spacious sounds that he has created for this album. The sound quality is impeccable and that convinces me that we will be hearing from Max Corbacho for many years to come. Definitely recommended by Ambient Visions.